I adore Barrington Stoke books. I think they have an amazing list of authors and I love that their main focus is to help struggling or reluctant readers. Plus every book I've read of theirs is interesting, exciting emotional or thought-provoking. They do an amazing job. So it was with excitement that I received these two books being published this year, especially by two authors that I've read and loved previously: Kevin Brooks and Aidan Chambers. 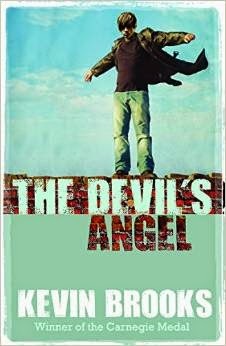 The Devil's Angel by Kevin Brooks was quite gritty and intense about two friends, Dean and Jack. There's plenty of drinking and violence and the sort of behaviour that you might expect from two uncaring teenagers. But there's something different about Dean. Jack and Dean are friends right from Dean's first day of school when he cames in and punches the biggest, toughest guy in school. But he doesn't seem to stop either, he needs more violence more unrest. It's quite hard reading this short story about these two friends. Even without subtle hints throughout the narrative it seems clear that this story can't end in a happy way with Dean's persistent path towards destruction. As a fan of Kevin Brooks, I felt like this book covered similar themes to that of Naked but I don't think that should matter too much. It still made me feel strong feelings and thoughts and I found it quite interesting. 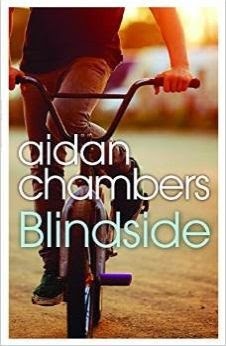 I wasn't quite sure what to expect when I first started reading Blindside by Aidan Chambers. I knew it would be about a boy involved in an accident and dealing with a lack of mobility. I was surprised by the depths of description towards Nate's accident and how much pain and suffering he goes through initially. Nate is a teenage boy with lots of athletic promise. He dreams of being a competitive runner but on his way towards a night out on his bike at a nasty junction, he's blindsided by a vehicle and wakes up in the hospital. With the sudden loss of his dreams, Nate goes through a whole range of reactions including anger and depression. And that is when we go into a story line that I don't normally enjoy: that of meeting someone else, full of life and worse off than our main character who teaches our main character to be happy and feel lucky for his lot in life. I did really enjoy Nate's anger and his descent into depression. I felt like these were realistic and believeable reactions to everything that has happened to him and even his interest in another hobby thanks to another patient.. Perhaps if the story were a bit longer and there was more time to develop different feelings I wouldn't have felt off about Nate's friendship? I'm not sure. Still, an interesting read!